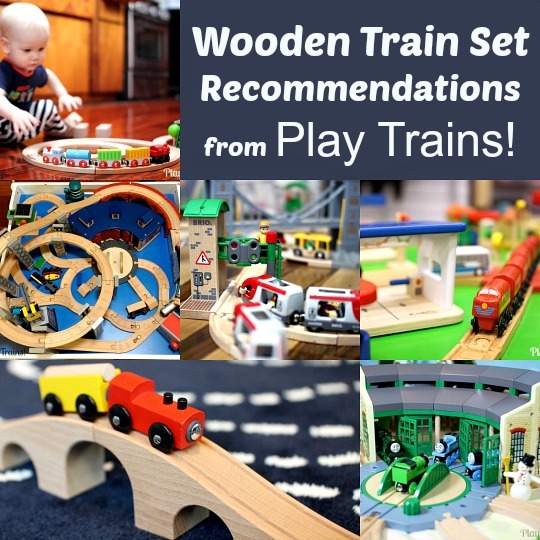 Once you have a basic wooden train set, the next direction you’ll want to take your layout is probably going to be up. 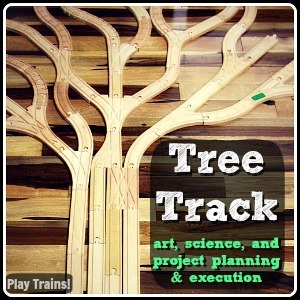 Wooden train bridges, mountains, and other elevated track features turn a train layout into an exciting, hands-on experiment in physics. 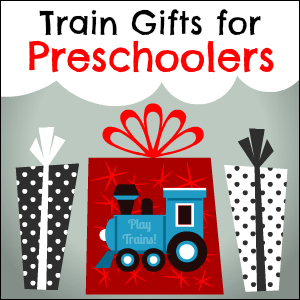 Bridges and slopes also create many more opportunities for problem solving, and the number of train stories where a track up a hill, mountain, or over a bridge is the main source of conflict — “I think I can, I think I can!” — should give you some idea of how inspiring they are to a child’s storytelling. The tricky thing with bridges and elevated tracks is that they tend to fall down a lot. I’ve carefully picked these products with an eye for avoiding that (those with their names in bold are ones we have experience with, the others I can judge pretty well from the photos at this point). After the list I have a few more tips for keeping elevated tracks from falling over. Product names in bold indicate that we have personal experience with the feature or set, otherwise I’ve used my experienced eye to evaluate products we haven’t played with. Skyline Suspension Bridge (Melissa & Doug): I generally don’t recommend Melissa & Doug wooden trains (though I love many of their other toys), but this is a standout bridge — tall, stable, and attractive. Even the track supports for the ascending tracks going up to the bridge are of a kind that holds onto the tracks better It takes two ascending tracks to get up to the top of this bridge, so it may not be an easy one to fit on a train table. (This is one of the reasons we almost always build train layouts on the floor.) However, if you can curve the track after the first ascending track one each side, you can reduce the overall width of the setup. Stone Drawbridge (Thomas): This is a really lovely bridge. Thanks to the lever-operated drawbridge, it requires interaction with the bridge whether the train is going over or under it. It’s a long bridge, and that combined with its shorter height means trains won’t derail when they get to the bottom of the slope. Over and Under Tunnel (Maxim): This combination tunnel/bridge looks like a fun way to add both of these elements to your train set. 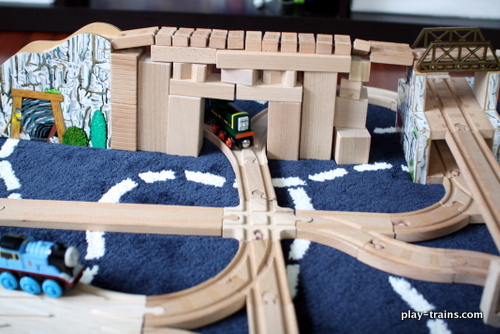 14″ Wooden Arch Bridge (Jesse’s Toy Box): This looks like a nice, functional bridge. Brio Lifting Bridge: Another nice, interactive bridge. IKEA bridges: Ikea’s bridges are fairly stable, thanks to their track connections being extra tight and their track supports extending up alongside the track. However, these bridges are very low, and most other brands of wooden trains won’t fit under them easily. We recently acquired two sets of the Bigjigs Construction Support Set. Each set comes with three stable, stacking track supports with short pieces of track built in, and they work wonderfully. Unfortunately, Amazon raised the price by $10 right after I bought ours, so don’t buy them for that price ($24). You can search for a better price elsewhere, or try these similar BRIO Stacking Track Supports. Another option for track supports that’s bound to stimulate creativity are the new block platforms from Dreamup Toys. 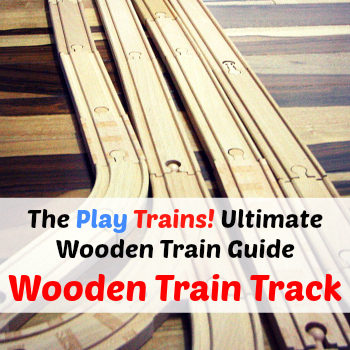 A track for wooden trains runs down the middle of each platform, which can be combined with interlocking blocks to build any height of track your child can imagine. Plus you can build on top of the platforms as well — so much potential for creativity! 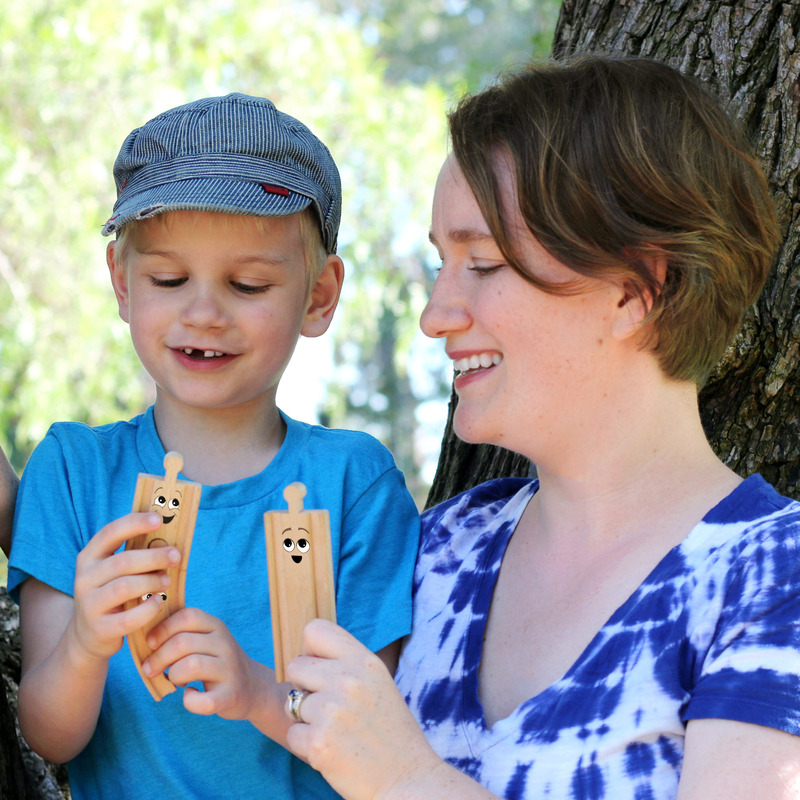 We have some on the way from the company, and we can’t wait to break out our DUPLO blocks and test them out. Spiral tracks are really fun elements to add to a train layout, though I rarely build ours in the spiral configuration. My favorite is the Thomas spiral set that the Little Engineer got for Christmas a couple of years ago, but unfortunately all the Thomas sets that included spirals are retired — you might try searching on eBay. We also own the Timber Log Spiral Set (Imaginarium), and it’s a little more challenging to put together, but over all a really fun set. The Construction Train Set (Bigjigs) is another spiral set from a good brand that looks like it would be a lot of fun, especially if you have a train fan who also loves construction vehicles. Update: I just was reminded that Bigjigs also makes a High Level Track Expansion pack that can be built in a spiral. If you have access to a 3D printer, check out my husband’s collection of train-related designs on Thingiverse for some supports you can print. 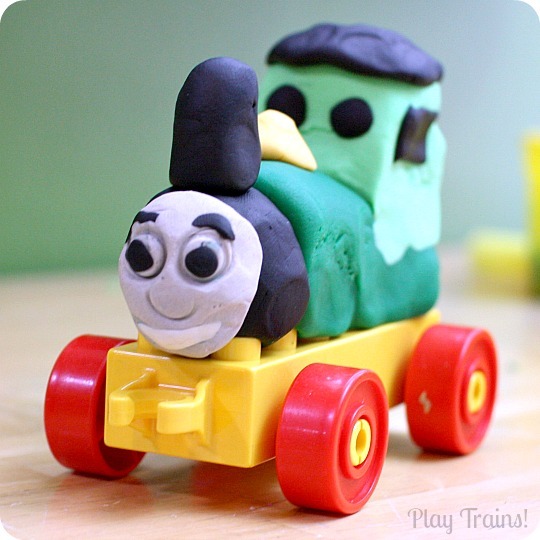 Our favorite are the Duplo-to-wooden train track adapters, which are really, really cool. Thomas and Belle to the Rescue Set: For a plastic bridge, this one looks pretty nice, and it stays together well. Gold Mine Mountain Set (Thomas): This fantastic set includes the best elevated element for wooden train layouts that I’ve come across. Travel Switching Set (Brio): This comes with a cute red bridge and an elevated, two-level station. 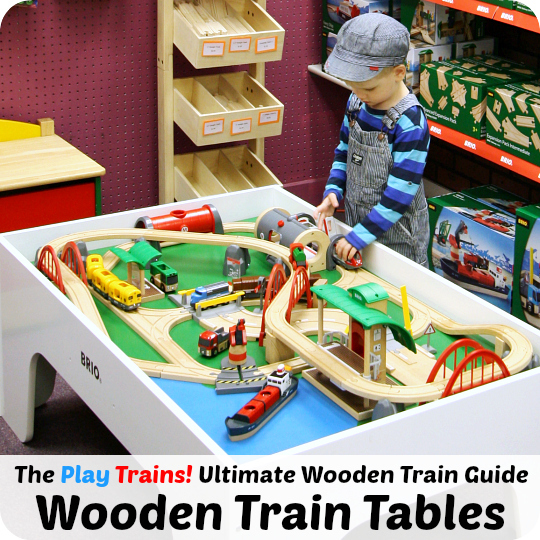 This is an excellent set for kids who like passenger trains, because unlike most wooden passenger trains, the passengers can actually go in the coaches. 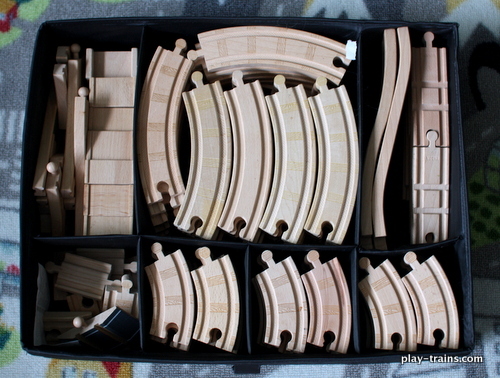 Tidmouth Timber Company Deluxe Figure 8 Set (Thomas): This set has a nice-looking hill that can be arranged in a couple of different ways. Mountaintop Supply Run Set (Thomas): It’s interesting to see Fisher-Price experimenting with these platform elements in the Thomas sets this year. One thing to love about this one is that they included two extra-long ascending tracks. Those are so useful, and so hard to come by. Treasure at the Mine Play Set (Thomas): This set, intended for playing out the end of King of the Railway, has an interesting bump track going up and into the mine. There is one part of the elevated section that rests on track supports, but they have high sides to hold the track in place, so they’d be better than most. Brendam Bay Shipping Co. Set (Thomas): Here is yet another new Thomas set with a platform, but this one has a warehouse and cargo drop incorporated into it. It looks pretty fun, and I suspect it would take a lot to knock this one over. Cargo Harbor Set (Brio): The bridge in this great set is unique in this list in that it isn’t elevated at all…at least, not until you raise it to let the container ship go through. Speaking of the container ship, it’s so, so cool! The cargo holds close up when you drop freight into them, and open when the magnetic crane lifts them up again. This set is especially fun combined with the Brio Train Ferry. 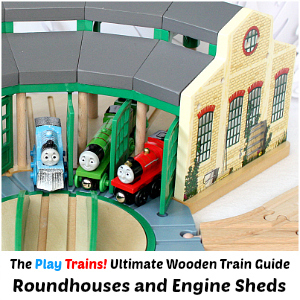 Brio Deluxe Railway Set: This is a huge set, but amazing, and could well set you up with all the wooden train stuff you need for an entire childhood. It includes three red Brio bridges and the elevated station from the Travel Switching Set. Imaginarium Rescue Train Set: The Little Engineer saw this yesterday, got really excited, and told me a whole story that he’d like to play out with the collapsing bridge. It also has an interesting tall track platform with a helicopter pad on the top. Mountain Railway Set (Bigjigs) — I’m not sure about how well the track would stay on the mountain, but the red track support is good, and track could be secured to the mountain if it slides around (see tips below). My child always bumps or knocks over elevated train tracks and bridges. How can I get the tracks to stay up? Most of the answer for this comes down to product choice — see my recommendations in the list below — but I do have a few tricks up my sleeve. No residue duct tape on the underside of the tracks. You can also make a tape loop to stick the tracks to a track support, or even to your plywood. 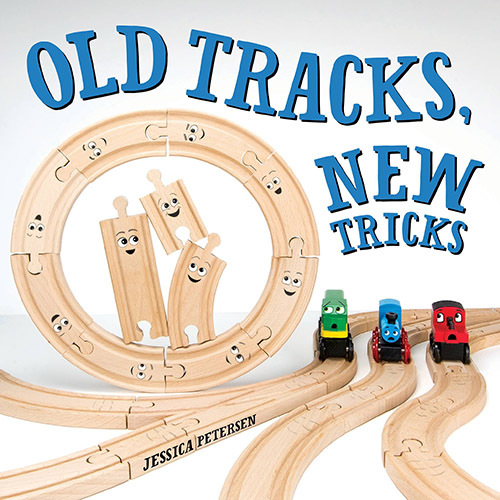 (I wrote about and demonstrated this tape in Damage-Free Decorating for Wooden Train Layouts.) We have no-residue duct tape holding tracks on top of the railing around the Little Engineer’s bed, and they’ve been there for over a year now. We’ve also used it to hold wooden building blocks to track and to each other in order to use them as track supports without having the fall over every two seconds. Suretrack track clips clip onto the tracks where they join, holding them together. You can see some in action near the top of our DIY wooden train platform post. Track supports that have wood or plastic that comes up alongside the track that rests on it work better than the plain block-style supports. This ponytail holder trick seems to work from my preliminary test of it. At least, it does when it doesn’t actually make the connection too tight when using track from different brands. Help! Our trains always derail at the bottom of bridges. What can we do? There’s pretty much one answer to this: you need a long enough straight track at the bottom of the bridge to slow the trains down before they hit a curve. 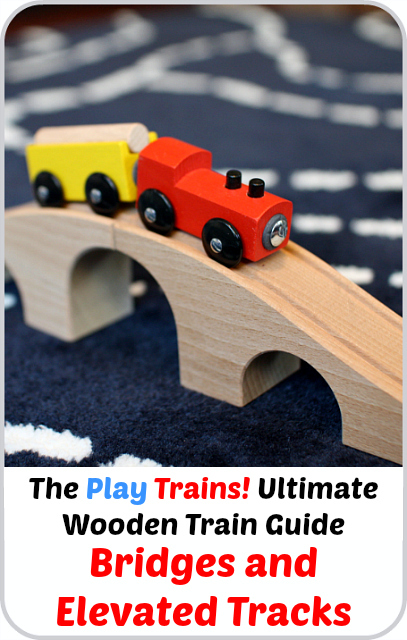 Unfortunately, when you buy a train set with a tall bridge or mountain, they usually give you only enough track to connect everything up, which often means very tight curves at the bottom of the slopes. 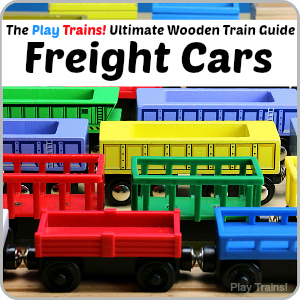 (For recommendations on inexpensive packs of long, straight track, see the Wooden Train Tracks installment of the Ultimate Wooden Train Guide.) If you have a straight track at the bottom of the slope and the trains are still derailing, make sure the slope and the track at the bottom are lined up straight. 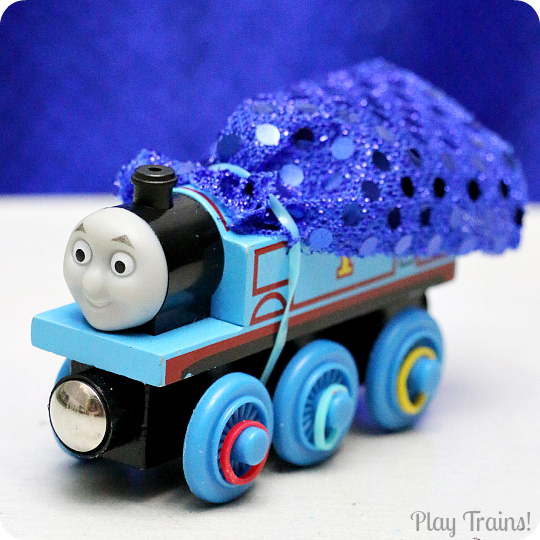 Avoid the style of bridge in this Thomas set. This kind of bridge stays up okay if directly bumped, but comes apart as the tracks in the layout around it shift around during play. If you can’t avoid having the tracks held up by track supports, look for track supports that come up the sides of the track to help keep them in place. What awesome advice! Thank you so much for sharing. Love that I am not the only one that has resorted to duct tape to keep those upper track pieces in place! Hello! we have the ikea rails and we are looking for some battery operated engines but nothing seems to match … the thomas engine is almost ok with the ikea rails when it is totally straight but de-rails on curves…..we do not have brio in greece. Any suggestions …..
Hi! I’ve been trying to think of some other options for you, but to tell the truth, the only other battery operated wooden train other than the Thomas and Brio ones that I know of is an Imaginarium train that’s available through Toys’R’Us in the US, but I’m not sure if Toys’R’Us exists in Europe outside of the UK. I suspect the Thomas engines are climbing up and over the edges of the curved tracks because of their rubberized wheels…I’m not sure you’d really want to do this, but maybe sanding the rubbery part a little bit so that it has less grip might help? I’m not sure if that would end up ruining the wheels or not, but it’s the only thing I can think of. You’re welcome! Thanks for reading it. 🙂 The Duplo connectors are really, really cool! I need to write a post about them eventually. We make and sell Duplo Adapters. Not 3D printed ones, but using ad adapter track and Duplo brick. We have some on Etsy or on our website. They are really cool! 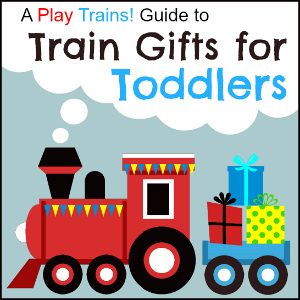 What don’t you like about Melissa & Doug train sets? Just curious since Grandma is getting the deluxe set for my three year old this Christmas. Mainly, it’s the lack of detail on the trains. They are often flat blocks with the shape of the train only cut out in one dimension. While that could be an aesthetic choice if the trains were coming from somewhere like Maple Landmark, it feels more like a cost cutting choice to me. I’ve also read a lot of reviews of the trains, and people generally seem to feel that the train sets aren’t quite up to the standard of some of the other toys. However, a lot of people order the M&D sets, and a lot of people seem perfectly happy with them. I believe the track is pretty decent…we have a few male/male and female/female connectors and they blend in with the rest of our collection as far as quality goes. 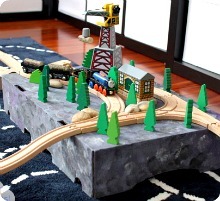 what do you think about this one – Imaginarium train table roundhouse with Rocky Mountain ? It’s a good value for the money. At least, we still use all of the stuff from our Imaginarium train table, even though the table is long gone (it still was in good condition when my mom sold it).